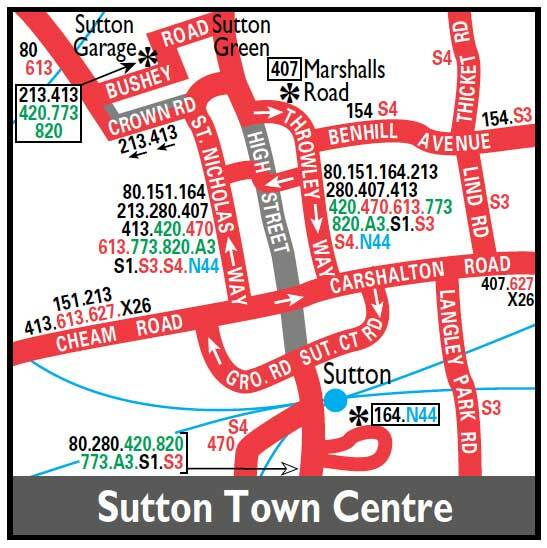 Daily joint operation with Route 164A introduced and converted to Routemaster operation at weekends - buses spare from Route 93. Daily conversion to RM operation - and Merton (AL) withdrawn. MS evening service withdrawn between Belmont and Banstead. MS extended from Morden to Lower Morden via withdrawn M1. Withdrawn between Raynes Park and Wimbledon but extended from Lower Morden to Raynes Park between peaks Mon-Fri.
Withdrawn between Belmont and Banstead. Mon-Fri extension from Morden to Raynes Park via Grand Drive withdrawn. New Contract and converted to low floor single deck operation. Daily Sutton (A) allocation re-introduced - Sunday (AL) withdrawn.